Planning your home gym doesn't have to be a frustrating chore. There are so many different types of strength training gyms available, that it may be difficult to choose. However, if you keep a few things in mind it will help you narrow down your choices. If you need a great setup that doesn't take up a lot of room, a streamlined style of gym setup like the Body Solid G5S Weight Stack Home Gym Machine makes a lot of sense. Nothing complicated and hard to use is going to get used often. The Body Solid G5S Weight Stack Home Gym Machine looks complicated, because like any good system, it has a lot of parts. What makes it so special is the pulley system that never needs to be changed between stations. No more getting up, figuring out what goes where and changing hookups in the middle of a workout. Your G5S is always ready, always setup and you can move fluidly from one workout to the next. An important feature in any home gym is the strength and durability of the frame and seating. You don't want a machine that bends, or wobbles. There's too much weight involved, and a workout machine that can't stand up to the pressure is dangerous to be around. The Body Solid G5S Weight stack Home Gym Machine is very strong and can handle all of the pressure you put to it. Other safety concerns with stacked weights can be the danger of fingers getting pinched in between the weights, or falling on young children whose curiosity can get the better of them. The single weight stack of the Body Solid G5S contains a hefty 210 pounds of weights, but they are all encased in a single tower to protect them from prying hands and body parts. The weight values are easily changed with a simple pop pin that can be operated from any position so you never have to get up and stop your workout to change weights. Space-saving home gym designs often sacrifice versatility for size. Not the Body Solid G5S Weight Stack Home Gym Machine. It has multiple workstations so you can work your abs, triceps, lats, thighs, calves, shoulders, back, chest and more and it comes with a workout DVD to guide you through all of the possible workout positions to get the most out of your new home gym. There is also a large, easy to read exercise chart, and to keep you hydrated, the Body Solid G5S has a water bottle holder, and a towel holder to keep you dry and comfortable. For beginners the price of the Body Solid G5S Weight Stack Home Gym Machine is a welcomed surprise. It is a mid-range price gym that offers all of the opportunities that the higher-priced versions provide. Trust is hard to come by, and a strong reputation is worth a lot of respect in the exercise industry. The Body Solid Equipment Company began in 1981 and fast built a strong reputation for home gym, and health club gym equipment. They make the same quality equipment for home use as they provide their industry customers, and the warranty can't be beat. It is a lifetime warranty on all of their equipment so you never have to worry about how to get a part replaced or fixed. 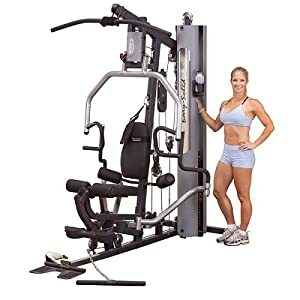 One of the only real drawbacks to the Body Solid G5S Weight Stack Home Gym Machine is that it has evolved over the years, and Body Solid made it better with each change. However, they haven't really adjusted their assembly instructions to reflect differences in the setup making it a little confusing to put together. There are also a lot of parts to assemble, and it will take awhile to get it ready to use. The Body Solid G5S Weight Stack Home Gym Machine is a great way to get in shape, and works well for users of any level of expertise. 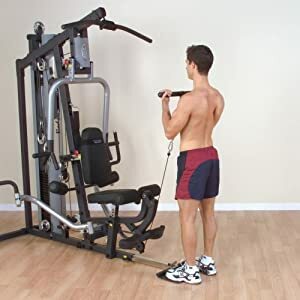 It is an affordable way to bring a gym into your own home, and its design makes it great for people with limited floor space in apartments, condos or just when you don't want a piece of gym equipment to take over a room in your home.